You might be a digital marketer or use Instagram for its pure entertainment value – either way Vivaldi can help you post on Instagram from your computer. 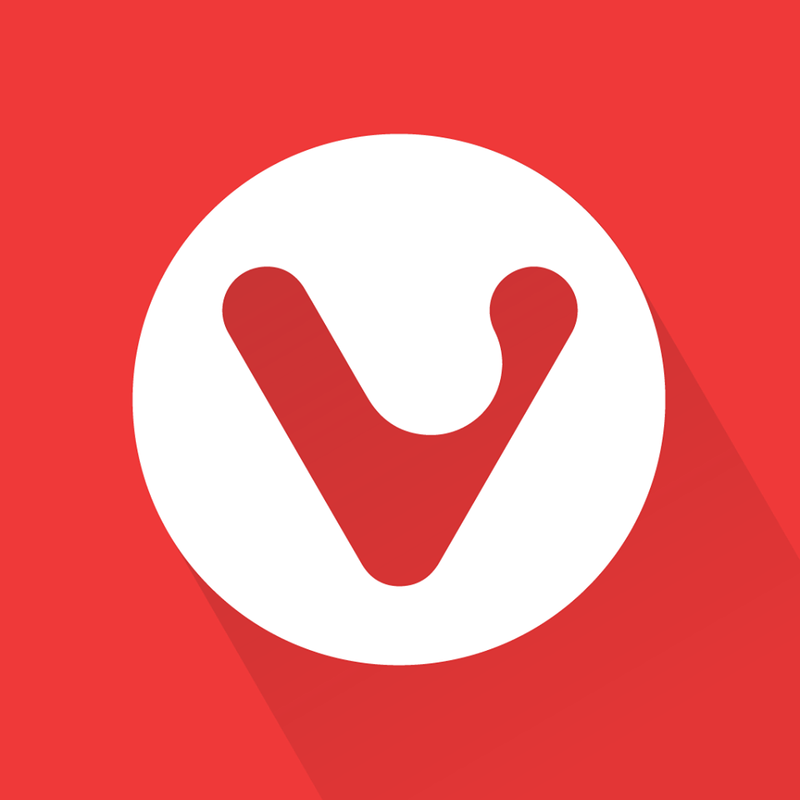 Vivaldi gives you the unique opportunity to open the mobile version on a desktop in one simple step. Let’s find out how and more. Instagram may need no introduction but for the unfamiliar, it is a free social networking app that lets users capture and share photos and videos. It is one of the top social networks. 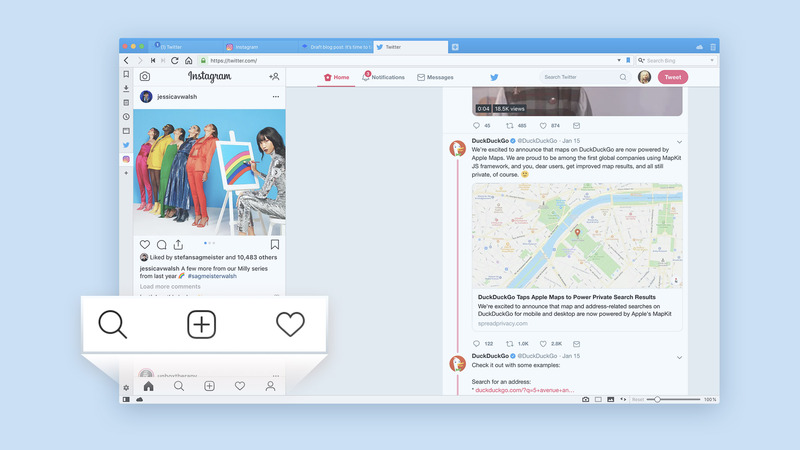 And if you are glued to this app, and at the same time spend a lot of time on your desktop browsing, Vivaldi lets you use Instagram like no other browser. A couple of years ago, Instagram added the ability to upload photos via a browser. However, only via a mobile browser. With Vivaldi, you can open the mobile version of Instagram on the desktop in one simple step. You don’t need to change any settings or download extensions. Just add Instagram as a Web Panel. Yes, it is this simple! 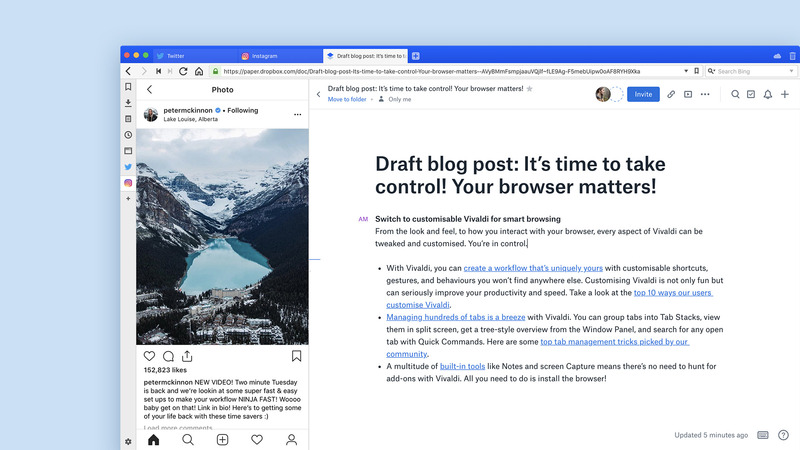 Vivaldi’s Web Panels allow you to display websites within the side bar of your browser, creating a split-screen view. Using a Web Panel, you can create your own Instagram control center. Once you add Instagram as a Web Panel, you’ll notice that the default view is the mobile view. If you want to see the desktop version, right-click on the Instagram icon in the Web Panel and select “Show Desktop Version”. Now you can post as if you’re on your mobile. And you get the filters too! You might like to hide the Vivaldi toolbar at the top of the panel. That toolbar lets you go back, forward, refresh and go to the home page but takes away from some of your screen space and is not native to Instagram (if you want a genuine Instagram experience). Just right-click the toolbar, and select “Toolbar” > “Hide” from the menu. You can bring it back if needed. If you’d like your Instagram Web Panel to open wider (or more narrow) than the rest of your Web Panels, select “Separate Width” (right-click on the Instagram icon) and drag to the width you like. Your Instagram panel will always open with the width you selected. In addition to this, here is another tip: “Copy Web Panel address” comes in handy if you want to share a post or feed with someone. If you need your Instagram to show as a tab, just right-click on the icon and select “Open in” and select one of the following “current, new, background” tab. You can also open it in a new window, background window or a private window. And to all those who are unfamiliar with Web Panels, this is the way you can add them. Just click on the ‘+’ icon in your Side Panel. Vivaldi will automatically fill in the URL of the website you have currently open, however, you can always type in whichever URL you like. You can even “float” the Web Panels! With this option, all the Web Panels will be overlaying your main window. You also have the option of making Panels auto-close if they lose focus (i.e. if you mouse over a different part of the window). That way the panel doesn’t get in the way of whatever else you are doing. Panel > Panel Options then select “Floating Panel” and “Auto-close Inactive Panel”. So now we can only say in this world of hashtags (highly and heavily used on Instagram), #SwitchToVivaldi! And if you still don’t follow us on Instagram, time to do so here.